On This Day (May 5, 1877) Hunkpapa Lakota Sioux Sitting Bull refused to surrender to genocidal American troops and led his band across the border into what is now Saskatchewan, Canada. Chief Sitting Bull remained in exile in Saskatchewan (then part of the Northwest Territories) for many years. His band lived near Wood Mountain, Sask. Sitting Bull refused a subsequent pardon and the chance to return to the USA. In 1881 hunger and cold eventually forced Sitting Bull, his family, and nearly 200 other Sioux in his band to return to the United States and surrender. 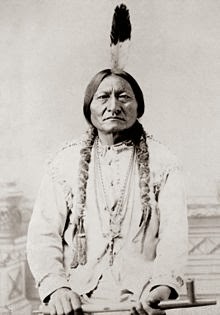 Chief Sitting Bull is notable in American and Native American history for his role in the major victory at the Battle of the Little Bighorn against Lt. Col. George Armstrong Custer and the U.S. 7th Cavalry Regiment on June 25, 1876, where Sitting Bull's premonition of defeating the cavalry became reality. Call it what you like. I call it what it is ..... racism. "OTTAWA - The Conservative government is resisting renewed calls for an inquiry into murdered and missing aboriginal women and girls despite a media report that suggests there may be hundreds more cases than previously thought. Public Safety Minister Steven Blaney was asked Thursday to finally call a inquiry in light of a report by the Aboriginal Peoples Television Network that Canada may be home to more than 1,000 cases of murdered and missing women.